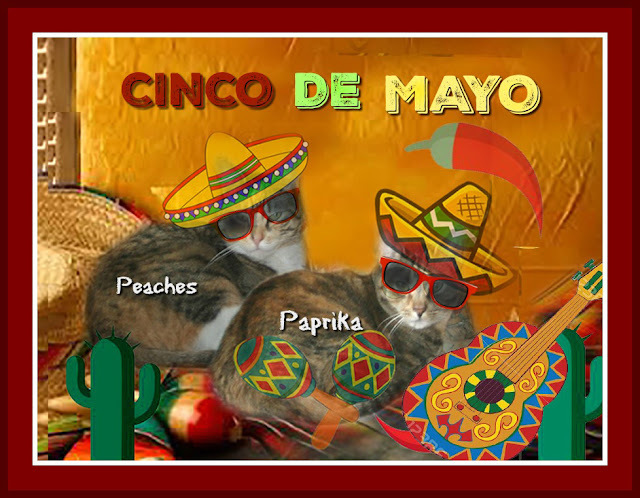 Wishing a very joyous Cinco de Maio Day to all our friends. As for us, we're on our way to get ANOTHER cool drink. Please join us! We were torn by indecision over sunglasses vs none. But after taking an official vote, the sunglasses won. We felt bad the sunglasses would hide our beautiful eyes, though, we decided to include our original pic where we are staring haughtily at the camera. After all, what is Catitude all about? So...the no-sunglasses version looks like you girls *before* the catnip margaritas start flowing, and the sunglasses version looks like you after you've had one or three. I like the sunglasses version! You look cute in both but we think the sunglasses are adorable! Happy Cinco de Mayo! You both look good all dressed up and the sunglasses are a great addition. You all have a great day. Sombreros AND sunglasses is our vote! Have a good one! Hola chicas! Feliz Cinco de Mayo! We vote for the sunglasses! The sunglasses are a fun add! We'll celebrate with you two! Without! Happy Cinco de Mayo! Y'all invited to a #Chilipawty tomorrow on Twitter. Oh, we thought it was about mayonaise! That explains a lot. You girls are purrfect model material no matter what you're wearing. 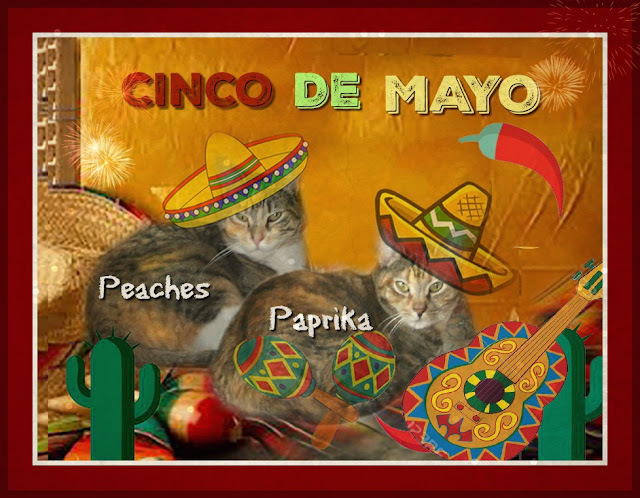 We hope your Cinco de Mayo was meowvelous! You do have gorgeous eyes, but the sunglasses are really cool too! We have to say we purrfer you haughty stares, but both pictures are purrty cool.